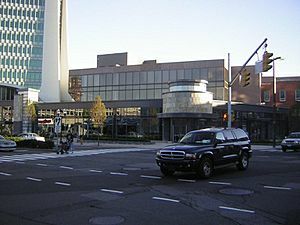 Downtown Stamford is the central business district of the city of Stamford, Connecticut, United States. Also known as "Stamford Downtown." It is an economically thriving area of the city, with major retail establishments, a shopping mall, a university campus, the headquarters of major corporations and fortune 500 companies, as well as other retail businesses, hotels, restaurants, offices, and entertainment venues. In recent years more housing has been constructed in the neighborhood including high-rise residential buildings, and more is planned. With transportation widely seen as one of the biggest challenges facing the Economy of Stamford, Downtown has become an important transportation hub, as well as a business hub for lower Fairfield County. For example, it is an area within walking distance of the Metro-North train station, which is one of the busiest on the New Haven Railroad Line. 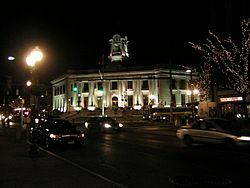 The Downtown area has been the heart of Stamford, Connecticut since colonial times. Much of the history of Stamford took place there. Most of the southern and central portions of Downtown have been designated as historic districts, listed as the Downtown Stamford Historic District on the National Register of Historic Places. In recent years, new development has consumed much of the Downtown area, with the additions of new high-rise buildings and office towers such as the new 35-story Trump Parc Stamford, parks such as the new Mill River Park development project, and housing such as the new 17-story Highgrove Condominium Residences. Other development projects include new student housing at the UCONN Stamford branch, residential housing, and the massive planned Ritz-Carlton Stamford development, which will include two 39-story hotel/condominium towers. The project is currently on hold due to the economic downturn in 2008. 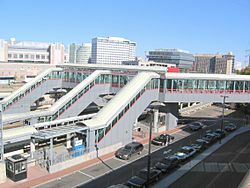 The city also plans to make improvements to the Atlantic Street underpass beneath the New Haven Line railroad tracks just east of the Stamford Transportation Center in order to alleviate a traffic bottleneck. The improvements are also meant to allow quicker evacuation of areas of the South End if disaster strikes. The project received a $245,000 earmark in the federal budget passed in December 2007. In relation to other neighborhoods in Stamford, the Downtown is east of the West Side (separated by the Mill River), north of the South End (separated by Interstate 95 and the Metro-North Railroad tracks) and Shippan (also separated by the highway and railroad), west of the East Side and Glenbrook, and south of Newfield, Belltown, High Ridge and Turn of River. Bull's Head, the mostly commercial area at the intersection of High Ridge Road and Long Ridge Road, is immediately north of the Downtown. The Downtown Stamford Historic District is a historic district that was listed on the National Register of Historic Places in 1983. The originally listed area included 56 buildings along Atlantic, Main, Bank, and Bedford Streets, and examples of Late 19th and 20th Century Revivals, Late Victorian, and Commercial Vernacular architecture. Its boundaries were increased in 1985 to include an area bounded by Atlantic, Main, Bank, Bedford, Summer between Broad and Main Sts. and Summer Pl. The 1985 boundary increase captured the only surviving area in downtown of lower-rent commercial structures such as warehouses, laundries, and stables. Its boundaries were further increased in 2002 to include an area including Late 19th And 20th Century Revivals and Modern Movement architecture, roughly, Bedford Street between Broad and Forest Streets. The 2002 increase added the 1939-built Avon Theatre and other buildings, adding Late Gothic Revival and Art Deco architectural styles not included in the first and second areas. The current boundaries of the historic district now encompass most of the southern half of Downtown. The historic district designated in 1983 included the largest remaining area of pre-1930s commercial and institutional buildings in downtown Stamford. The 1985 boundary increase captured the only surviving area in downtown of lower-rent commercial structures such as warehouses, laundries, and stables. The 2002 increase added the 1939-built Avon Theatre and other buildings, adding Late Gothic Revival and Art Deco architectural styles not included in the first and second areas. One Landmark Square, the second tallest building in the city, at 21 stories, the tallest being the new Trump Parc, at 35-stories high. Recently, Downtown Stamford has experienced a boom in high-rise building construction. Trump Parc Stamford -- Finished in 2008, the 35-story condominium tower is currently the tallest building, office and residential, in Stamford and the second tallest building in the state, after the 38-story City Place I in Hartford. The building currently features 170 condominium units and a 6-story parking podium. This tower will soon be surpassed by another tower owned by Marriott Residence Inn that is currently under construction located at Atlantic Street. One Landmark Square -- Completed in 1973 at a cost of $35 million, the skyscraper became the tallest building between New York City and New Haven between 1973 and 2008. The "Landmark" in its name is no exaggeration. 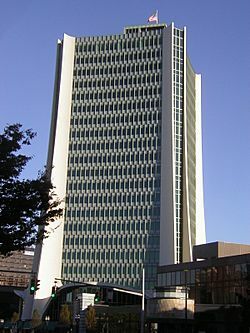 When it was built, the 21-story office building towered over a much lower skyline, and it remains the second-tallest building in the city, and the tallest office high-rise, as well as one of the most distinctive buildings in Downtown Stamford. Five smaller buildings designed by Moshe Safdie, such as the Biltmore Apartments, were later built around the tower. Highgrove Condominium Residences -- Finished in 2009, the 17-story condominium tower is currently the third-tallest building in Stamford and the second-tallest residential high-rise. St. John's Towers -- The three cylindrical, 17-story towers were finished in 1971. One Stamford Forum -- Looking like an upside-down ziggurat above its three-story parking garage, the building has an enclosed arboretum rising from the ninth floor to the penthouse roof, which is covered by 76 acrylic glass domes. Formerly the "GTE building" named after a former tenant, the 13-floor structure is 196 feet (60 m) high. GTE used to show off the building in numerous magazine advertisements. In the 1990s, the Tresser Boulevard entrance to the building was changed (in a design by Hellmuth, Obata & Kassabaum) from a "formidably stark concrete wall of a parking garage" to "a more inviting entrance ... clad in blue-gray ceramic tiles, with a lobby, canopy, colonnade and small garden." One Atlantic Street -- Art Deco interiors, with murals in the ground-floor bank, and Art Deco exterior details as well. The red-brick/white marble building at the corner of Broad and Atlantic streets was finished in 1931 and for a long time was the tallest in Stamford. University of Connecticut Campus -- The 225,000-square-foot (20,900 m2) building with the vast, green glass facade at the corner of Washington and Broad streets was designed by Perkins Eastman. Old Town Hall — The Beaux Arts building was built from 1905 to 1907 and served as the seat of local government until the early 1960s. The building opened for business on March 20, 1907. The last mayor to work there was J. Walter Kennedy, who moved to the Municipal Office Building that was on Atlantic Street (now torn down) in about 1961. The Old Town Hall held offices for the city government until all city offices were moved to 888 Washington Blvd. in 1987. The "Fish Church," or the First Presbyterian Church of Stamford, was designed by Wallace K. Harrison, the chief architect of the United Nations buildings in New York City, and opened in 1958. The fish shape is obvious to anyone who drives by, but the floor plan is also fish-shaped. The stained glass windows in the sanctuary contain more than 20,000 pieces of faceted glass. They depict the story of the Crucifixion and the Resurrection. The 32-foot (9.8 m)-high cross is faced with wood from Canterbury Cathedral. "Brilliant blues, reds and yellows make up the walls -- and seem to fill the air. 'It really is like being inside a jewel,' says Reverend David R. Van Dyke, a co-pastor. 'When I bring people who haven't been here before, there's an audible gasp.'" (Life Magazine, April 14, 2005) In March 1958, the $1.5 million church was dedicated with capacity crowds filling it for three services. Gurley Building (1924), also known as Valeur Building, an eight-story tall, narrow building at northwest corner of Main St. and Atlantic St. intersection (see photo #4). "Sullivanesque"; designed by Edward B. Stratton and built by Clinton Cruikshank. Fidelity Title and Trust Company, 129 Atlantic Street. Built by Clinton Cruikshank. Weed's Hall (1886), 109 Atlantic Street. Narrow five-story building, the only Stamford building with a cast iron facade. 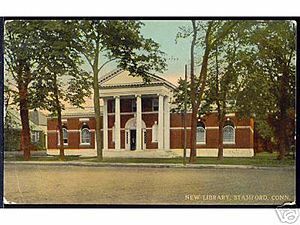 Ferguson Library (1910), two-story Georgian Revival brick building (see photograph #18). Designed by Egerton Swartwout. It had an addition built in 1931, to the rear, which was replaced and further enlarged in 1981. 15 Bedford Street (1932), Art Deco two-story commercial building. (see photo 6). spandrels with triglyph fluting". (see photo 8). Ritz-Carlton Stamford -- The Ritz-Carlton is a planned hotel and condominium complex for Downtown Stamford. The project will include two 39-story hotel/condominium towers, as well as 70,000 square feet (6,500 m2) of retail space. Once completed, the two buildings will become the tallest in the city. The project is currently on hold due to the 2008 economic crisis. Mill River Park, which separates Downtown from the West Side, is to be expanded in an $8.5 million project, including $4 million in federal funding earmarked in 2007, with the city government financing the rest of the cost. The federal funding is to pay for removing the Mill River dam and dredging. That part of the project is the first step in the long-planned renovation of the park. The project plans call for narrowing the width of the river to less than half of its current expanse, which would expand the park's area and provide space for more amenities. The master plan provides for a carousel, fountain, ice rink and network of trails connecting a greenway with the Kosciuszko, Southfield and Scalzi parks. Removing the dam will also allow fish to swim up from Long Island Sound. As of 2007, the U.S. Army Corps of Engineers had spent $800,000 on preliminary studies, planning and design. The cherry trees in Mill River Park were presented to the city on April 27, 1957 by Junzo Nojima, a native of Japan who had settled in the city in 1926 and in 1932 became the first Japanese man to own a restaurant in the state (K&J Three Decker Restaurant on Atlantic Street). Nojima gave the city 120 trees, and for three years he watered each one until they took root. He gave the city instructions on how to care for them, but when they were overlooked, he began tending the trees himself. On Arbor Day, April 27, 2007, the city celebrated the 50th anniversary of the gift with a ceremony at the park. Broad and Bedford Streets in Downtown Stamford. The Downtown Special Services District, known as Stamford Downtown, is booming with exciting events from June through December. Whether it’s a tour of a world class sculpture exhibit, "Alive@Five" and "Jazz up July" outdoor concerts in Columbus Park, Arts & Crafts on Bedford Street or a giant helium balloon parade that marches through Downtown, Stamford Downtown is the place to find it all. These events bring thousands of people into the Downtown. Downtown Stamford Facts for Kids. Kiddle Encyclopedia.